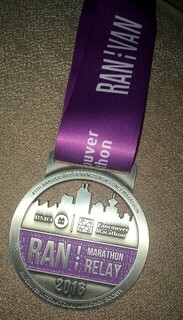 Yesterday was the 45th running of the Vancouver marathon and I ran in it! I ran across the finish line of the Vancouver marathon yesterday. I did not, however, run the entire 42.2 km. 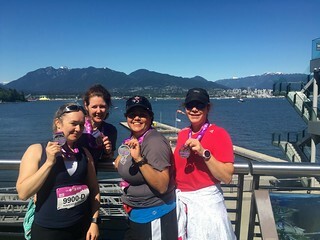 Instead, I took part in the marathon relay with my friends Julie, Jen, and Pam. The way the relay works is that you have 4 runners on your team – Runner A starts at the starting line with all the full marathoners, but at the 12 km mark there is a relay exchange point at which Runner A hands off a belt, which contains your team’s timing chip, to Runner B, who runs the next 12 km, and then hands the belt with the timing chip to Runner C, who runs 5 km and then hands the belt off to Runner D, who then runs the remaining 13 km of the race. There are timing points at each relay exchange area, so the time of each leg, as well as the time of the entire duration of the race, is recorded. Honestly, I think this may be the only way I’ll ever participate in a full marathon – the way where you don’t actually have to run the full 42.2 km! Our team was named the Tenacious Tempos! Props to Julie for coming up with the name! I was Runner D – also known as the anchor. The downside of being the anchor is that you do a lot of waiting – there are shuttle buses that take the relay runners from the start area to their exchange points, but the buses got us to our exchange point at 9:15 am and by my team’s estimates, I wasn’t expecting to start until 12 pm! Also, the area where the shuttle buses dropped us off, which is also where the portapotties were located, was about eleventy billion kilometres from the actual exchange point and while many runners went over to the exchange and then had to walk all the way back to go pee before they actually ran, a small group of us decided that we had no interest in doing all that extra walking, so we hung out by the buses (where there were benches and stuff to sit on) until it was time for a pre-race pee and then we headed over to the exchange. Happily, it was a nice sunny day and I was prepared with sunscreen and a book to read. I also spent some time chatting with my fellow anchors from the other teams and Andrew dropped by to say “hi” to me as well. Me, waiting for Julie (Runner C) at the exchange point. I have no idea why my hair is this terrible *before* I even started running! The plus side of being the anchor is that you get to run over the finish line! I tend to find finish lines very motivating and usually can find some energy to put on a good kick at the end – even if I feel like I’m just barely hanging on up until the finish line is in sight, once I see it, I find a previously unavailable store of energy for a sprint to the finish! But I’m getting ahead of myself! 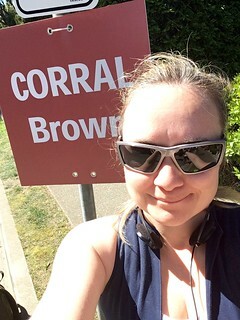 The route that I got to run was a lovely one – we went over the Burrard St bridge, then along Pacific, which turns into Beach, which then takes you into Stanley Park, and then we went all around the Seawall, and then along Georgia and up to Pender to the finish line. It was flat and scenic, which is just how I like my race routes to be! It was also very hot – especially since I didn’t start running until about noon! I spent a significant portion of the race wiping the fog from my sunglasses, because I was so hot and sweaty! As for the running itself, I was pleased with my run. As you know, I’ve only really been training for about a month due to having all the sicknesses in the early part of this year, so my fitness level is way below what it was last year. I’ve been running my zone 1 runs at about a 7:30 min/km pace and my recent blood lactate assessment1 shows all my zones to be considerably slow compared to this time last year (which is not surprising, given that this time last year I’d spent ~4 months training for the BMO half marathon). But I decided that my relay run would be a good chance to see how well I could do in a zone 2 run (as most of my training focuses on zone 1, which helps to raise my aerobic threshold, but is not the zone that you want to run a 13 km or a 21.1 km race in), and I was pleasantly surprised with what I could do! I managed to run the 13.2 km at an average pace of 6:27 mins/km – and I felt strong! The last 3 km I definitely had to work to keep up that pace – my body was tiring and wanted to slow down, but I dug deep and focused on maintaining the pace. It’s funny, because as I was running I was thinking “Wow, I can’t believe how fast I’m running this! This is awesome!”, but afterwards I realized that last year I’d run 8 km more at an average pace of 5:45 km/km! But it’s all relative and given my start to this year, I was happy with my performance. The official race results clocked my leg of the race at 1:29:51, but that includes the exchange (which necessitated a hug with Runner C before I took off on my leg) – my runner watch indicates that my actual running time was 1:26:55. After the race, the Tenacious Tempos went for a lovely brunch – which really is the main reason that we do these races. Well, the brunch and the medal! The Tenacious Tempos showing off their race bling! 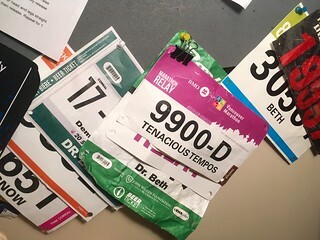 My race bib has taken it’s place on my board along with its fellow race bibs. 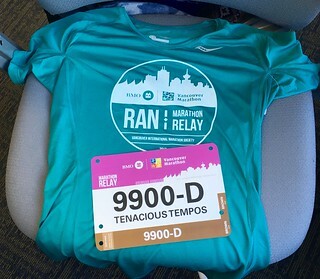 Also, this is probably the coolest race number I’ve ever had: 9900! A new medal for my collection. Medal #2 for 2016!